I don’t know why but one July day in Houston, Texas in 2002 I got it in my mind that I wanted to run a marathon. I had never been a serious runner; I wasn’t in particularly good shape at the time and I wasn’t looking to take my fitness to some lofty “next level”. I had never been particularly taken with the sport of running; in fact I found it to be exhausting and kind of boring. But, on this sweltering summer day I decided I wanted to run the 2003 Houston Marathon that was to take place the following January and for some reason I couldn’t talk myself out of it. Our friend Lin was there to meet us and the finish! Without any knowledge about how to run a marathon I went out and started training. It was hot, miserable and I hated it – but I kept going out and running. While I was out I started meeting people and eventually I found a running group and started doing runs on weekends with them. It was still hot, it was still miserable but as the saying goes, misery loves company. Eventually, the weather, my distance and finally my demeanor all started to improve. It was actually starting to become, barely, a little fun! Long story short, I kept working, didn’t give up and on January 19, 2003, at the pathetic time of 5:40:14 I completed the 26.2 mile race (I think kudzu grows slightly faster). Admittedly I might have had finished sooner if I didn’t slow down at a donut “fuel” and a beer “hydration” station that had been set up along the route. After I completed the race I didn’t want to run another step and for a long time I didn’t. I did however know that one day I would want to start running again and so I set a new goal. Not a very lofty goal, but a goal; to run another marathon, “sometime” in the next decade. Well, it is the next decade and I haven’t forgotten the goal that I set for myself eleven years ago and I have started running again. I didn’t know it would be after beginning this retirement adventure but better late than never. This time I plan to run in an as yet undetermined marathon sometime late in 2014 or early 2015. Training in Thailand in the summer is about as equally miserable as training in Houston in the summer and you have to add in hills. I am however gaining strength and endurance and I feel that I am pretty much on pace to make my new goal. This time however, with concurrence (prompting) from my partner, fellow traveler and running buddy Sarah, I/we are going to spoil and reward ourselves at various milestones along the way. 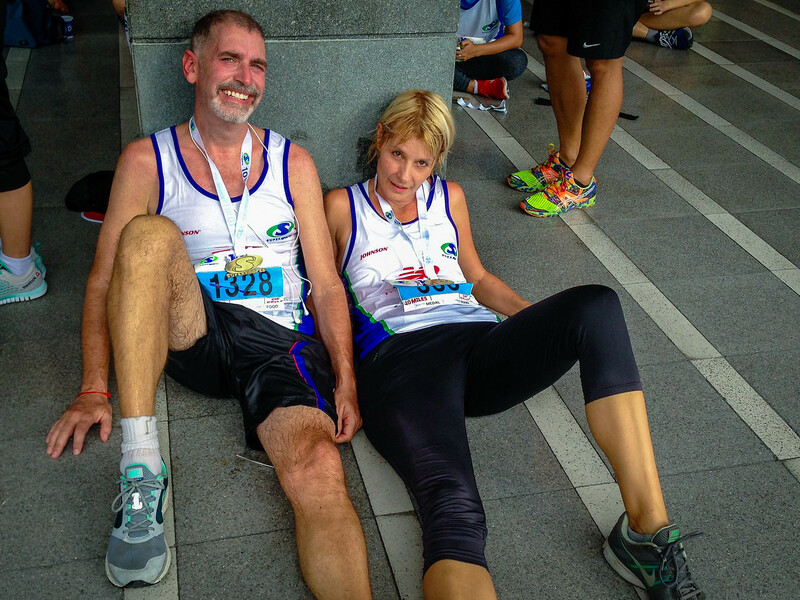 When we heard about the “Supersports 10 Mile International Run” in Bangkok, a race designed to help runners transition from running 10k races (of which we have done a few now) to half-marathons, we decided to sign up. When two of Bangkok’s Top 10 five star luxury hotels, The Okura Prestige and The Peninsula Hotel, agreed to host us, how could we refuse? 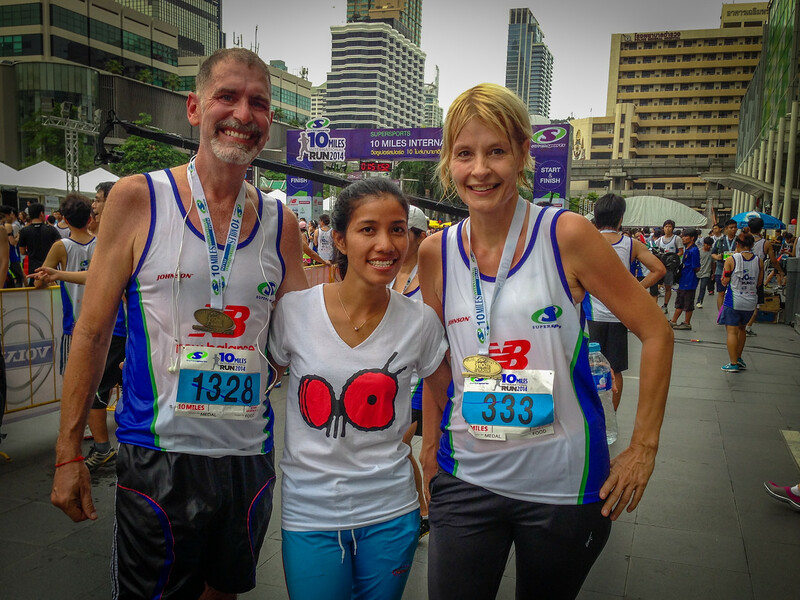 The race started on a June morning at the Central World Shopping Mall on Sukhumvit Road at 5:00 AM. It was already hot and the sky was drizzling. It was however pretty inspiring to see 4,000 people up at that hour, gathered to do something as silly as we were about to do. There is always something motivating about running in a large group and when the starting horn went off, despite the weather, I was eager to get going. There were spectators shouting encouragement all along the route through the city and they really kept me going. By the time I finished my clothes were completely soaked with drizzle and sweat; I could have jumped in the river to dry off. My legs were a bit more rubbery than I had hoped but it felt great to finish. Sarah completed her run in a great time and it was time to collect our medals and continue our “Heaven and Hell” weekend with a little more heaven and a massage. If you have been here for a while you know I don’t have what I consider to be a “normal style” of travel. One day I may be sleeping in a bamboo hut the next may find me, like it did during this weekend in Bangkok, in over the top luxury five star hotels it is variety that makes life an adventure. This is a great story about determination, goals and following your gut! The great photo at the end of the story is an excellent indicator of exhausted success: smiles, sweat and slight physical defeat! Congratulations Jonathan and company. You both look exhausted but I guess that’s the expected look after any kind of physical exertion in the humidity of the Bangkok summer.